The bottom axis indicates the level of production — the number of units you make. The left axis indicates value in dollars. Where total sales equals total costs, the company breaks even (which is why that’s called the break-even point). The shaded area to the upper right of this break-even point is profit. The shaded region to the lower left is net loss. 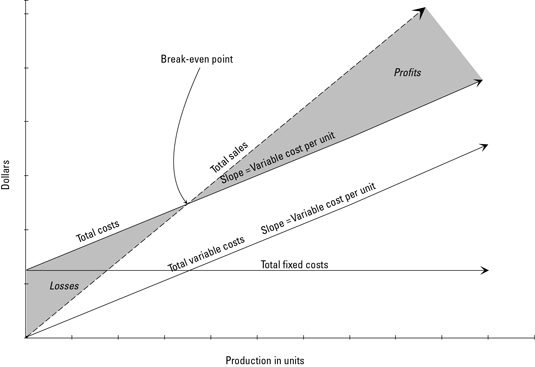 Total variable costs are a diagonal line because the higher the production, the greater the variable costs. The total fixed costs line is horizontal because regardless of the production level, fixed costs stay the same. Total costs equal the sum of total variable costs and total fixed costs.